Today I worked my core with my 43. I did X-crunches!!! I counted a right and left crunch as 1 so it was really 86 total crunches to complete this 43. 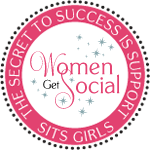 Today was 6 am boot camp – it was full of lunging, kicking, punching, twisting!! Everyone should feel it through-out their entire core by tomorrow!!! And it was muggy – I literally looked (and felt) like I had just gotten out of the lake by the time we finished!! Oh – wrong kind of muggy!!! I decided to let boot camp be my only workout today!! I’m gearing up for a huge day on Saturday – I will just say that Friday is my 300th consecutive day of 43s so that means it’s time for another LONG run!!! My right calf still has a bruise and every time I run or do any plyo (so pretty much every day!!) – I have a burning sensation in it. 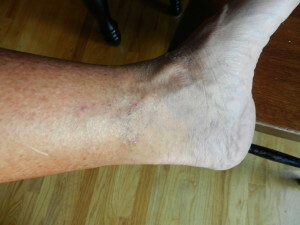 And my left ankle is still bruised, hard to the touch and stays swollen about 90% of the time. She said that some people take up to 6 months for everything to heal and that I’m one of those lucky people!! 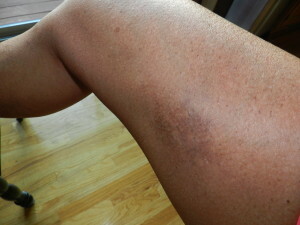 I told her that the bruises don’t really bother me but my legs hurt 10x more now than they ever did before the surgery. Her response to that – an odd look and then she said well they look a lot better than the last time I saw you. Yes, but they hurt and I’m an athlete and don’t need another reason for my legs to hurt!!! So, in November I will have a needle stuck into my legs numerous times to finish treating the veins (unless I back out and decide to just live with them!!!). 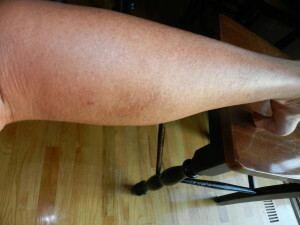 Clearly my legs are better than the last follow-up I did on the surgery. But, even though I can do all of my normal activities, they still aren’t completely healed and they truly do hurt much more now than before I started all of this. So, my thoughts/opinions still haven’t really improved – if I had to go back in time to April, I would not go through with the surgery. Lesson Learned (the hard way!!)!! Previous PostThe Power of ONENext PostAre you Scared of the Dentist? Great to see your hard work. 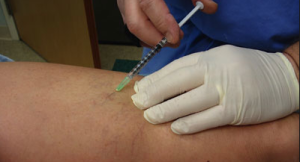 I think the sclerotherapy is the best treatment for the varicose vein as it is not costly and no surgery is required.